The Abecean Sea (/ə.biː. 'siː.ən/ ə-bee-see-ən) is a body of water to the west of Tamriel that sits between Cyrodiil, Hammerfell, Valenwood, and Summerset Isle. The sea is encompassed by the Eltheric Ocean. The sea surrounds several islands. Stirk is the easternmost and lies just off the western coast of Cyrodiil. Farther west is Stros M'Kai, which lies to the south of Hammerfell and is similarly dominated by Redguards. Due west of Stros M'Kai is The Chain, a series of three islands of which little is known, a lack that also to applies to Cespar, a larger island to the west-northwest. Just northwest of Cespar is Herne, which was used as a temporary refuge by the Redguards as they migrated across the sea from their ancestral home in Yokuda. Lastly, at the western ends of the sea, are The Systres and Pankor. 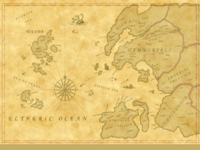 The Systres is a group of three islands northwest of Summerset Isle, and Pankor lies to their northwest. A whirlpool located somewhere in the Abecean, known as the Maelstrom of Bal, is rumored to be a portal to Oblivion. Ships which ride its waters are said to disappear. It is known that Abecean whales were hunted down for their wax since, at least, the Second Era. The sea lends its name to the Abecean Longfin, although the species is only known to inhabit the waters of Skyrim.